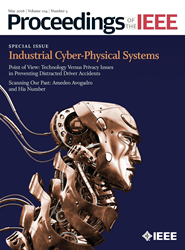 Proceedings of the IEEE presents the latest developments and achievements in industrial cyber-physical systems. The special issue is the first to bring together papers focusing on the architecture, design, enabling technologies, and applications of ICPSs. The technological, economic, and social impacts of Industrial Cyber-Physical Systems in an industrial environment are so enormous that the whole process is labeled as the Fourth Industrial Revolution. Proceedings of the IEEE, the most highly cited general-interest journal in electronics, electrical and computer engineering, and computer science, has released a special issue focused on the developments and achievements in Industrial Cyber-Physical Systems (ICPS). The special issue is the first to bring together papers focusing on the architecture, design, enabling technologies, and applications of ICPSs. The 18 paper issue is grouped into four sections – ICPS architectures and standards; ICPS interoperability; ICPS engineering methods and tools; and ICPS application. Emerging trends and visions of ICPSs for future investigations are also analyzed. “Using Smart Edge IoT Devices for Safer, Rapid Response with Industry IoT Control Operations” by M. W. Condry and C. B. Nelson presents a model that combines the capabilities of smart Internet of Things (IOT) devices with control system gateways using real-time challenge response for secure control operations. “Engineering Methods and Tools for Cyber-Physical Automation Systems” by R. Harrison et al. reviews engineering approaches that have been proposed or adopted to date and introduces a component-based cyber-physical systems (CPS) engineering toolset while considering the industrial context for the engineering of CPS. “Real-Time Wireless Sensor-Actuator Networks for Industrial Cyber–Physical Systems” by C. Lu et al. surveys recent advances in real-time WSANs for industrial control systems. “The Cybersecurity Landscape in Industrial Control Systems” by S. McLaughlin et al. surveys the state of the art in industrial control system (ICS) security, identifies outstanding research challenges in this emerging area, and explains the key concepts and principles for deployment of cybersecurity methods and tools to ICSs. “Smart Grids: A Cyber-Physical Systems Perspective” by X. Yu and Y. Xue presents an overview of challenges for smart grids in the context of CPSs. The paper outlines potential contributions that CPSs can make to smart grids, and points out the implications of current technological advances to smart grids. “A Vertical and Cyber-Physical Integration of Cognitive Robots in Manufacturing” by V. Krueger et al. shows how the potential of cognitive robots has not been fully exploited due to the lack of vertical integration with existing IT infrastructures. This paper reports on considerations and findings from a research project that is developing such a cognitive CPS and applying it to an automotive industry case. “Cyber-Physical Control of Road Freight Transport,” by B. Besselink et al. reviews how modern information and communication technology supports a cyber-physical transportation system architecture. It also presents a CPS approach toward the control and coordination of a large-scale transportation system. To learn more about the challenges and solutions for ICPSs and what the future holds for these innovative systems, please visit the Proceedings of the IEEE’s website. Founded in 1912 and first published in early 1913 (originally as Proceedings of the IRE), Proceedings of the IEEE is the most highly cited general-interest journal in electrical engineering and computer science. This journal provides the most in-depth tutorial and review coverage of the technical developments that shape our world, enlisting the help of guest editors and authors from the best research facilities, leading-edge corporations and universities around the world. For more information on Proceedings of the IEEE and the latest ideas and innovative technologies, visit http://www.ieee.org/proceedings, LinkedIn and Facebook. IEEE, the world’s largest technical professional association, is dedicated to advancing technology for the benefit of humanity. Through its highly cited publications, conferences, technology standards, and professional and educational activities, IEEE is the trusted voice on a wide variety of areas ranging from aerospace systems, computers and telecommunications to biomedical engineering, electric power, and consumer electronics. Learn more at http://www.ieee.org.